Did Shumlin Swing Senate Race After Leaving Washington County? Four days before Vermont's primary election, Gov. Peter Shumlin sold his East Montpelier abode and returned to his hometown of Putney. But even though he'd moved to Windham County by Election Day, he may have altered the outcome of a state Senate race in Washington County. In that contest, former Statehouse sergeant-at-arms Francis Brooks led Montpelier attorney Ashley Hill in the Democratic primary by just one vote after a recount earlier this week: 3,709 to 3,708. Vermont Superior Court Judge Timothy Tomasi is set to rule on the status of four contested ballots at a Friday hearing. Whoever prevails will win one of three Democratic slots on the general-election ballot for three Senate seats. At an unrelated press conference Thursday in Burlington, an unusually chatty Shumlin revealed who he had voted for in several primary races. He said he'd cast ballots for gubernatorial candidate Sue Minter, who prevailed in her bid for the Democratic nomination, and lieutenant gubernatorial candidate Shap Smith, who did not. Asked about the hotly contested Senate race, Shumlin had to think for a second. "I gotta go back and dig into my memory on that," he said. "I had three votes. And I know they were — I wanna say the one I knew the least was Ashley Hill. So I think I voted for the other three." The other three Democrats in the race were Brooks, Sen. Ann Cummings (D-Washington) and Sen. Anthony Pollina (P/D-Washington). Cummings and Pollina both won berths on the general-election ballot. Shumlin then disclosed his change of address, which hadn't previously been reported. "I think it's worth mentioning that I've moved out of Washington County since, so I can't vote in any future election," he said, explaining that he was living temporarily in Putney while building a house in Westminster. According to East Montpelier municipal assistant Denise Brown, Shumlin voted by absentee ballot in Washington County on July 25. A property transfer record shows that he sold his 27-acre property to a local couple on August 5 for $675,000. Election Day was August 9. 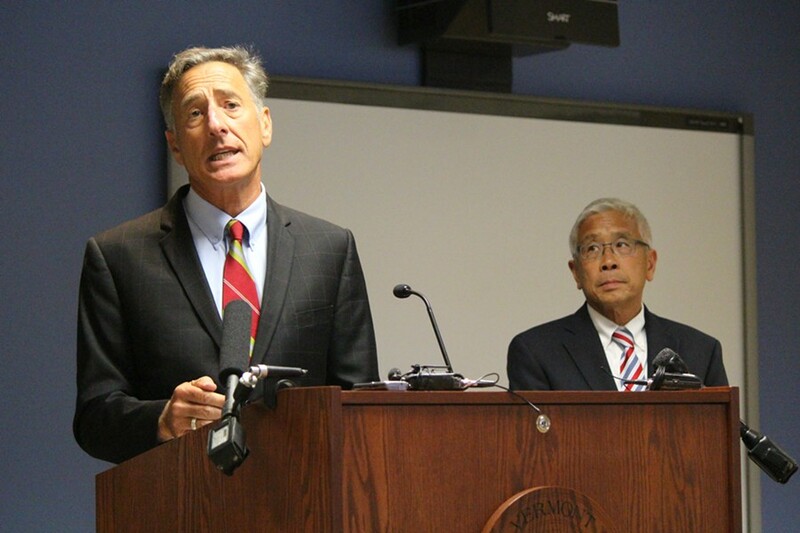 At Thursday's press conference, Shumlin maintained that his Washington County vote was perfectly legal, despite his return to southern Vermont. "I want to assure you that I was very aware the questions might be asked, so I voted a week early, while I was still a resident of East Montpelier, as did my wife Katie," he said. According to Will Senning, elections director in the Secretary of State's Office, Shumlin's interpretation of the law is correct. Voters retain the right to cast a ballot in their former town for up to 17 days after moving. Shumlin said he realized that his vote may have made the difference in Brooks' nomination, should the judge certify the current tally on Friday. "I understand that," he said. Reached later that afternoon, Brooks said, "I'm very happy that the governor voted for me when he had the opportunity." Hill didn't sound quite so pleased. "On a personal level, yeah, it's a little bit of a bummer to know that," she said. But, she added, "It is what it is." "Obviously, I don't expect to get everyone's vote. I admire [Shumlin] for sharing who he voted for," Hill said. "That's pretty great that he's comfortable admitting that, and I totally respect his choice."